Cargille Immersion Oils are in full accord with the FDA requirements. To date, no other immersion oils meet the FDA criterias. Cargille Immersion Oils are PCB (polychlorinated biphenyls) free. Type A & B, with viscosities of 150 and 1250 cSt (centistokes), respectively, meet these requirements. The greater the gap between cover glass and objective, or condenser and slide, the more desirable high viscosity becomes. Type A, with 150 cSt, reduces any tendency to trap air bubbles, thus avoiding image degradation. Type B, with 1250 cSt, is thick enough for viewing multiple slides with one application, thus saving time during batch processing. Cargille Immersion Oils A, B, NVH, OVH and 300 can be blended for intermediate viscosities. Use immersion oils type NVH or OVH. The greater the gap between the objective and the cover glass or between the microscope slide and the objective, the more necessary high viscosity becomes. The very high viscosities of type NVH at 21,000 cSt and Type OVH at 46,000 cSt give excellent results for these applications. Type 300 has been specifically designed to meet results for optimum optical imaging and mechanical processing, medium viscosity of 300 cSt. Fluorescence microscopy require special immersion oils with extremely low fluorescence. Type LDF and HF both exhibit extremely low fluorescence. Type HF exhibits slightly more fluorescence than type LDF, but type HF is halogen-free. Type FF is virtually fluorescence free, but not ISO compliant. Viscosities for type LDF, HF and FF are 500 cSt, 700 cSt and 150 cSt respectively. For non-critical fluorescence application, one could also consider immersion oils type A and B which both have low fluorescence. Use type 37. Elevated temperatures can be caused by sub-stage illuminators, environment or other causes. Developed for working at human body temperatures there is no image degradation above the standard calibration temperature of 23C. Can be blended with type B to place the temperature of calibration proportionally between 23° and 37°C. Type B and type 37 both have a viscosity of 1250 cSt at their respective calibration temperatures. Why do Cargille Immersion Oils Meet the DIN 58 884? Immersion oil specifications must meet the design requirements of old instruments and become the design criteria for new instruments. Without these specifications, it would be much harder for the microscopist to find the proper oil for his or her particular instruments' requirements and optical imagery would suffer. The specifications adopted by DIN resulted from their study of instrument requirements of many manufacturers. The proposed specifications were submitted for review, with Cargille Laboratories serving as liaison for the American manufacturers. The present trend toward tighter specification for optical properties is under a program of the International Standards Organization (ISO). 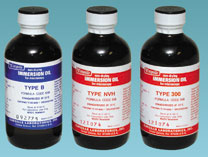 Cargille Immersion Oils are supplied as a microscopy accessory by American Optical and Bausch & Lomb, and accepted for use by all foreign microscope manufacturers. Cargille Immersion Oils are synthetic hydrocarbons, natural petroleum derivatives that contain no solvents and no PCB's. These oils are stable, non-drying, odorless, safe for lens and handling, and easily removable. MSDS sheets are available. U MSDS Low viscosity (150cSt), low fluorescence. U MSDS High viscosity (1250cSt), low fluorescence. U MSDS Medium viscosity (300cSt). U MSDS Very high viscosity (21000cSt). U MSDS Very High Viscosity (46000cSt). U MSDS Optimized for 37°C, High viscosity (1250cSt). U MSDS Extremely low fluorescence, Medium viscosity (500cSt). U MSDS Extremely low fluorescence, halogen-free, Medium viscosity (700cSt). U MSDS Virtually fluorescence free, Low viscosity (170cSt). Citifluor AF87 is a medium viscosity immersion oil with a refractive index of ~1.52 at room temperature (20°C). This oil is ideal for confocal laser scanning microscopy and FISH label with DAPI and Cy dyes. Citifluour AF87 should be stored at room temperature. Low temperature may cause sediment to develop and reduce performance. The PELCO® Optical Lens Tissue is a high quality optical lens tissue for lenses, optical instruments, electron microscopy and similar applications. PELCO® Optical Lens Tissue is fully lab tested and is comparable to the Ross lens tissue paper in regards to structure, softness, properties and cleaning capabilities. It is a direct replacement for Ross lens tissue and fully compatible for all applications. The tissue is made of 100% new stock, free of minerals and vegetable filler. This lens tissue does not lint or scratch and will not disintegrate under vigorous manipulation and is acid-free with excellent wicking properties. 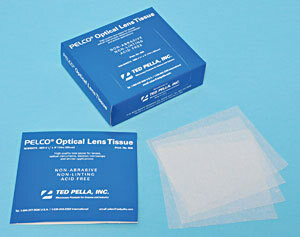 The size of the PELCO® Optical Lens Tissue is 114 x 127mm (4-1/2" x 5") and is available in a box/1000 sheets or in a pack with 6 booklets of 50 sheets each.